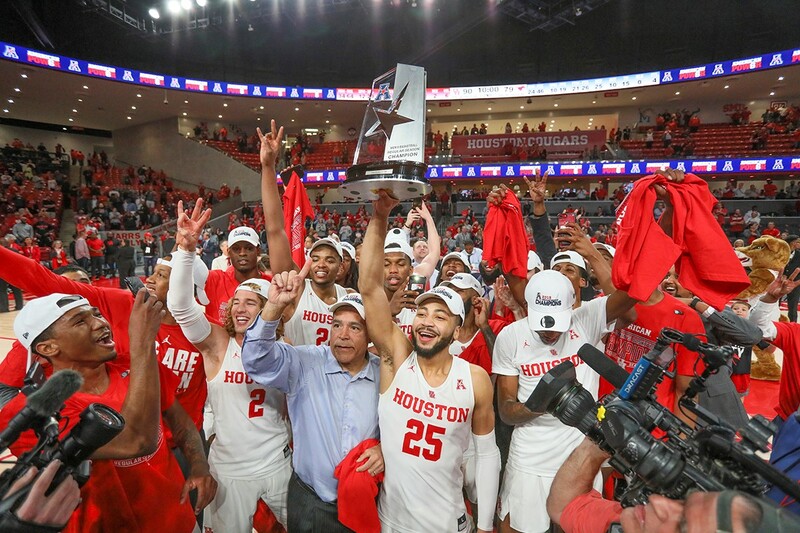 If you haven’t heard, the 2018-19 University of Houston men’s basketball team, including proud Houston native and Westbury Christian graduate, Galen Robinson Jr. (who created the slogan #ForTheCity) are the 2019 American Athletic Conference (AAC) champions. This season they were ranked in the top 10 nationally, which hasn’t happened since the ’80s. Head Coach Kelvin Sampson is a semi-finalist for national coach of the year. 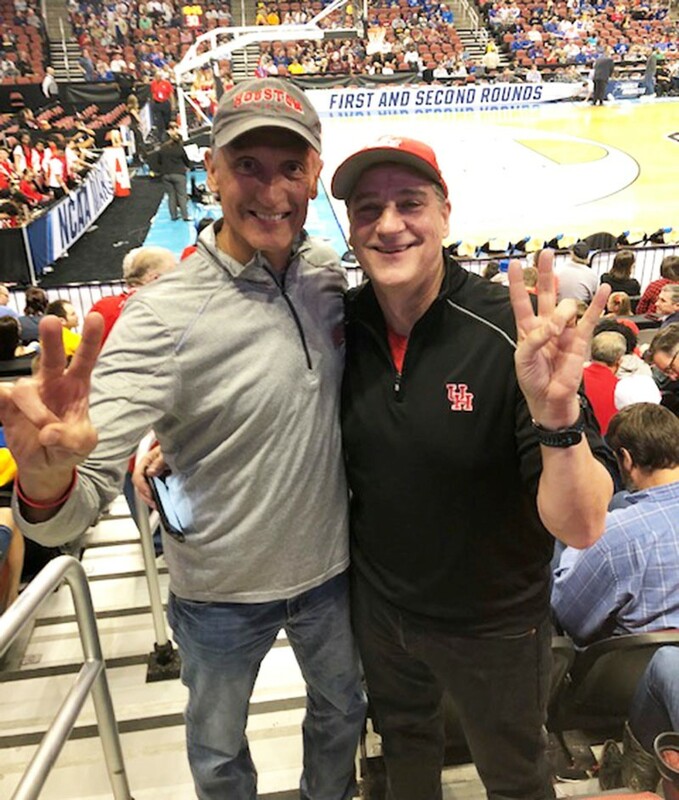 With March Madness upon us, get inspired by some very loyal University of Houston Cougar fans that have been going to UH games before any current players were even born. Many basketball lovers can say they were fans of the infamous 1982, 1983 and 1984 University of Houston Phi Slama Jama teams. But how many people can say they had amazing floor seats so close to the court they could practically reach out and touch the players for every single tournament game? Gus Pappas and Ronnie Bradshaw at the first two rounds of the 2018 NCAA tournament in Wichita. Bellaire resident Gus Pappas can because he had the honor of being a proud University of Houston cheerleader during those historical years with the Texas’s Tallest Fraternity. Gus may have retired his megaphone, but he’s still happy to cheer on the Cougars even though now he has to pay for his seats. Gus traveled to Wichita for the 2018 UH games and plans to travel to every 2019 March Madness game, too. 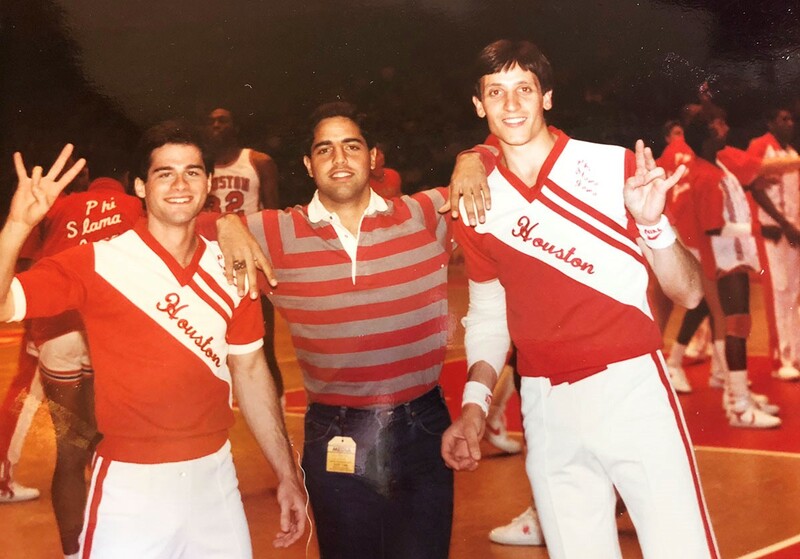 Gus Pappas with longtime friend, Phillip Mallios, and fellow cheerleader, Mark Emmitte, during the 1983-84 March Madness. On March 5, 2017, Cougar Nation said thanks for the memories to the aging Hofheinz Stadium where basketball games had been played since 1969. 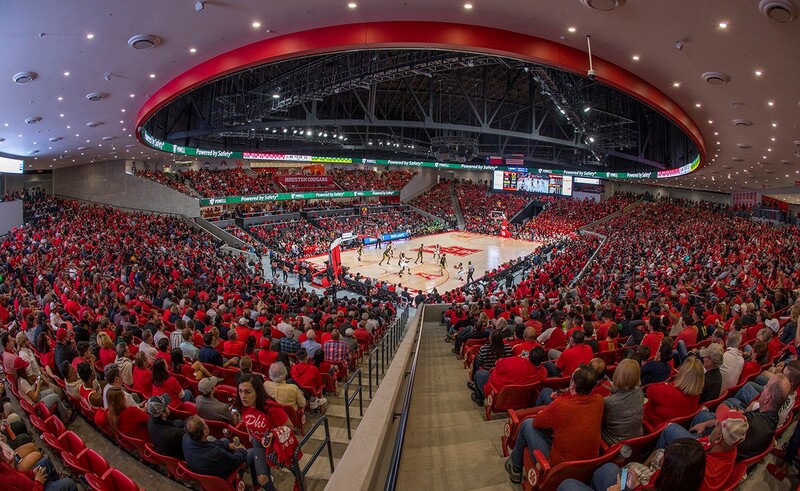 While the arena was being built during the 2017-18 season and the early part of the 2018-19 season, the Cougars played their home games at Texas Southern University’s H&PE Arena. 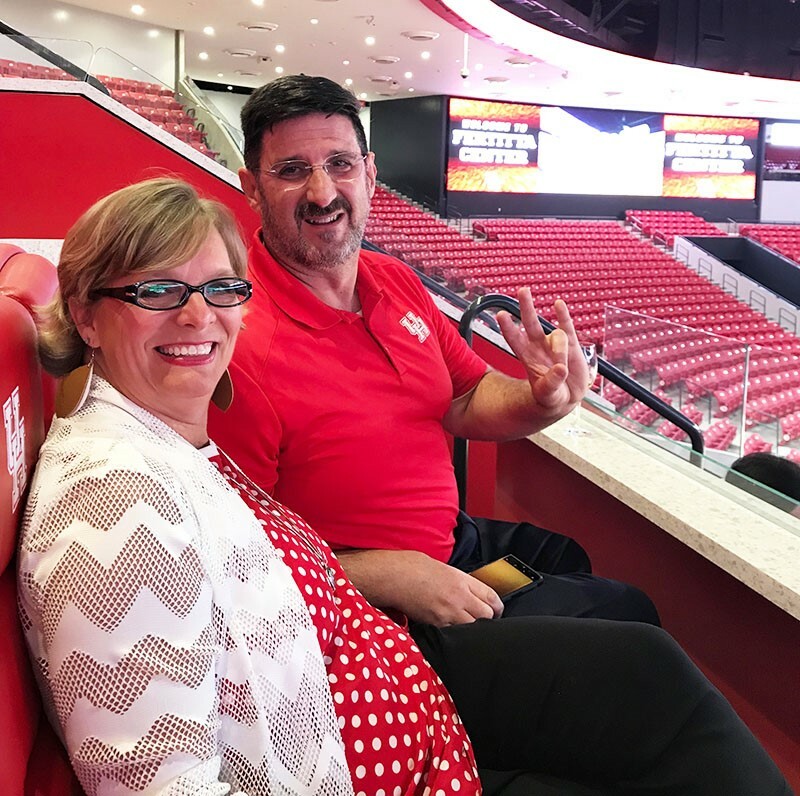 Longtime season ticket holders Patty and Kevin Godfrey, checking out their plush new seats at the inaugural game at the Fertitta Center on Dec. 1, 2018. 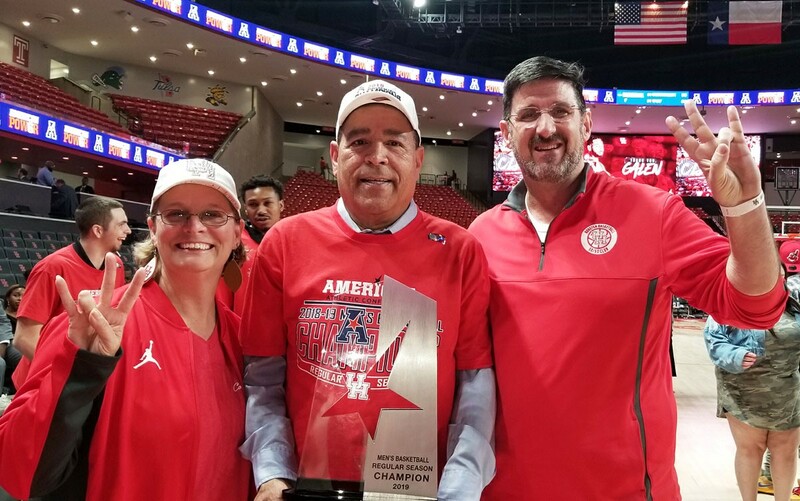 Patty and her husband Kevin are excited about the new chapter for UH basketball at the state-of-the-art Fertitta Center, which hosted its first game on Dec. 1, 2018. Season ticket holders since graduating in the ’80s, Tim and Pamela O’Rourke have remained true to their alma mater. 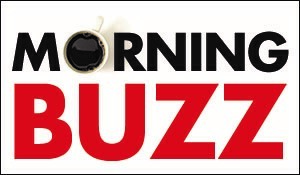 Even Tim, a glass-half-full kind of guy, admits that over the last three decades there have been some trying times when the team was been consistently “not great” (including a 2-14 conference game record one year). Tim and Pamela, along with other fans, were thrilled to hear that the Cougars drew a No. 3 seed and they’ll open the NCAA Tournament with their highest seeding in 35 years. The March Madness journey begins on Friday, 6:20 p.m. in Tulsa, Okla., versus Georgia State. Hopefully this March Mad adventure will end with a national championship trophy. 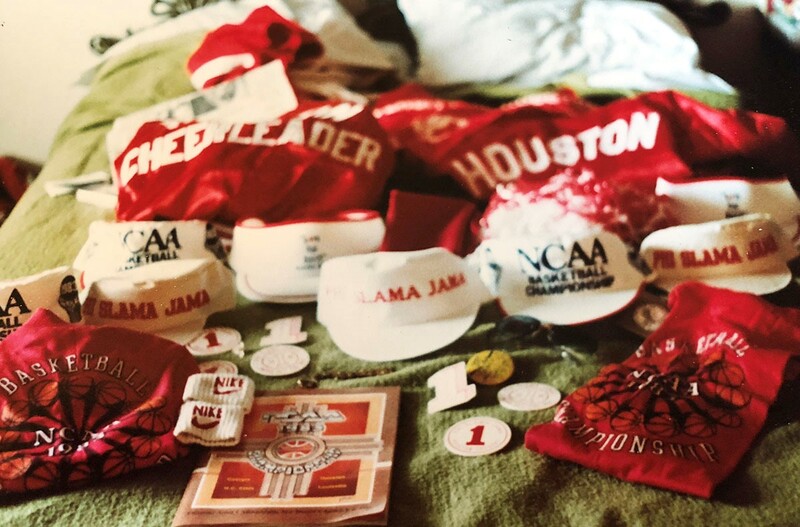 Gus Pappas' collection of cheerleader gear from the 1982-83 Phi Slama Jama year.